The HUD for the MJOLNIR Mark VI Powered Assault Armor. A heads-up display, or HUD, is a transparent display that presents data while minimizing any obstruction to the user's view. Virtually all armor systems used by the UNSC Armed Forces incorporate a HUD, including the MJOLNIR armor, SPI armor and the ODST armor. Ordinary UNSC infantrymen from the Army and Marine Corps may utilize shooting glasses which have head-mounted displays projected on their tactical goggles or eye-screens. The Covenant also employ HUDs in combat armor, such as the Sangheili combat harness. In the various models of the MJOLNIR Powered Assault Armor, the sensors augmented into the Spartan's body display the soldier's vital signs on the HUD. Additionally, the HUD also reports the strength of the wearer's shields through the energy signatures it emanates. Weapons' heat and ammunition levels, as well as grenade type and count are also detected through sensors placed in the Spartan's gloves. In the MJOLNIR HUD, each type of weapon that the gloves detect has its own unique aiming reticle in relation to the type of ammo that it projects and its statistics. The reticle is also compatible with the scope of ranged weapons when installed. The motion tracker is another important feature displayed on the HUD. Located in the right-hand armor gauntlet, it can be configured to sense and track movement in a variety of radii, depending on what the user wants it to be. Due to the insertion of IFF tags in UNSC soldiers, the radar can distinguish friend (yellow or blue) from foe (red). Finally, the way point indicators are an on-screen directive that point out important objectives or locations in the Spartan's mission, and are extremely useful, measuring the distance the Spartan is from the objective. When operating in teams, Spartans employ a system of status lights on their HUDs. The lights (blue/green, amber and red) can be manipulated by the wearer at will and are most prominently used to acknowledge orders or report complications. The SPARTAN-IIs and IIIs also use them as an efficient channel of non-verbal communication, using combinations of the lights as a messaging system. A reference chart of the HUD in the Halo Reach beta. A meter displaying the relative vitality of the user. A gauge tracking the quantity of ammunition available for weapons carried. A counter tracking the number and type of grenades carried. A targeting reticule which changes relative to the weapon currently in use. Acknowledgment lights from other members of the wearer's team. Maps and information uploaded over the wearer's TACCOM. The Mjolnir heads-up display runs on a piece of firmware known as a Basic Input/Output System. The following is a list of Mjolnir armor with known BIOS. The heads-up displays used by conventional UNSC infantry, including the UNSC Marine Corps and ODSTs, are largely similar to that of the MJOLNIR system, displaying weapons and grenades carried by the user as well as their ammunition, and projecting a targeting reticle to assist aim. Many infantry HUDs, such as those used by UNSC Marines and the cadets at Corbulo Academy, incorporate a motion tracker, although at least some models of the ODST helmet lacked one as of 2552. The shield bar is absent in armor systems which do not possess energy shielding, though health information is displayed. The HUDs also typically include a compass wheel in the center of the upper portion. Heads-up display visuals are provided through the Marine's UNSC tactical eyepiece or ballistic goggles. Additionally, some HUDs including the one used in the ODST armor system, integrate a sophisticated battlefield intelligence system, the VISR, that improves the users vision in low light areas, also outlining objects in the immediate area - green outlines are "friendly" units, red outlines are "enemy combatants" and blue outlines are discarded or abandoned equipment and weaponry that can be used. The system can also track data and display tactical information, such as maps and waypoints. UNSC heads-up displays typically use a BIOS firmware interface to function. The following is a list of armor types with known BIOS. HUD for MJOLNIR Mk. V, from Halo: Combat Evolved. The heads-up display is the main source for information in-game, though the appearance of the HUD has changed dramatically between each game. In Halo 3, there is a slight convex appearance to simulate looking through a real visor. Also, the MJOLNIR shields flare up in a grid-shaped pattern, to simulate the player is taking damage. In Halo 2 and Halo 3, the HUD is able to register two weapons when the Spartan is dual-wielding. In the campaigns of Halo 4 and Halo 5: Guardians, the player can now see parts of the player character's helmet interior on their HUD. The aiming reticle on the HUD changes based on the equipped weapon and whether the player is scoped in or not (only for certain weapons). Even vehicles and known heavy weapons have their own reticles. For example, the open circle reticle on the M90 and M45 shotguns tells the player that although the shot will land somewhere in the directed area, the distance and position are rather unpredictable. In Halo 4, the Binary Rifle's reticle is huge when not scoped in, but it compresses to a much smaller size when the player is scoped in. The Type-32/Type-54 Ghost's reticle tells the player that the plasma shots will travel as far as the two dots show, but can slightly drift off to the left or right. The HUD in Halo 2 is the only one in the trilogy that does not display any kind of information on the direction of the fire when the player is hit. Both Halo: Combat Evolved and Halo 3 utilize arrows that show the player where the shots came from; however, the arrows in Halo: Combat Evolved are much more general than the ones in Halo 3. Halo 4 uses semi-circles with two arrows above them to denote where the damage came from, while Halo 5: Guardians uses a set of semi-circles similar to the damage indicators found in other FPS games; these also turn green if the player takes friendly fire from an ally. In Halo: Reach, when the player's shields are down, the word "Warning" will show up in the depleted shield indicator. Also if a player's health is below yellow, it will continuously flash. 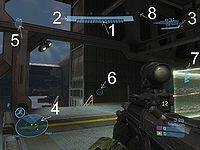 In Halo: Reach, the heads-up display gives the player a brief description of the weapon and Armor Ability they are currently using by pressing the Back button. However, this can only be used in the Campaign. In Halo 5: Guardians, if the player's health bar is emptied without the player dying, it will then be seen flashing red. The warning effects shown on the HUD when the player's shields are down and when the player's health bar is flashing red flash twice as quickly when the player is playing as any member of Blue Team (John-117, Fred-104, Kelly-087, or Linda-058). The radius of the motion tracker also changes between the games, from a 15 meter radius (Halo: CE) to a 20 meter radius (Halo 2), a 25 meter radius (Halo 3), a 30 meter radius (Halo 4), and a 40 meter radius (Halo 5: Guardians). In the Halo 5: Guardians campaign, Linda-058 and Holly Tanaka are equipped with the Advanced Sensors armor mod, which expands the motion tracker's radius by 25% to 50 meters. Custom games in Halo 3, Halo 4, and Halo 5: Guardians allow the player to change how far the radar reads (10 meters, 25 meters, 75 meters, or 150 meters). A downside to a large-range radar is that the blue dots representing allies and the player and the red dots representing enemies shrink in size and become harder to see. There is more information available on this subject at Heads-up display on the English Wikipedia. Although the games, novels and manuals all refer to a head-up display (HUD), this is technically an incorrect description of the equipment featured in-universe; it is far more accurate to refer to the equipment as a helmet mounted display. By definition, a head-up display is a fixed unit whereby one must look 'up' in order to see it. For example, the HUD in a fighter jet is mounted to the glareshield and cannot be moved. If the pilot looks to his left or right, he can no longer see the display. The term HUD originally came from looking 'up' out of the cockpit as opposed to looking down at the gauges on the instrument panel. The correct in-universe term for the equipment in the Halo games is a Helmet Mounted Display, or HMD. A display mounted or projected onto a helmets visor, the result of which being that no matter where the wearer looks, the display will remain in front of his eyes. HMD's have been in military service as early as the late 1970s when the Soviet Union was developing the MiG-29 Fulcrum and are currently starting replacing HUD's in the newest generation of fighter jets, and the new Lockheed Martin F-35 Lightning II does not feature a HUD at all, instead completely relying upon the pilots HMD. It is unknown how the HUD changes from Halo 2 to Halo 3, as John possesses the exact same armor in both games. While the changes are obviously for gameplay reasons, no in-universe explanation has been offered for them. It is possible that the armor has customizable HUD layouts available that can be changed according to the user's preferences. This also explains the radical differences between the HUD of Halo: Combat Evolved and that of Halo: Reach, as both games feature Mark V armor. From Halo 2 onwards, when one looks up they can see less of their equipped weapon but when looking down, more of it is seen. In Halo 4, John-117's Mark VI HUD incorrectly displays the word shield as "sheild". The HUD of the MJOLNIR Mark V.
The HUD of the MJOLNIR Mark V with flashlight activated. John-117's Mark V HUD in Halo: Combat Evolved Anniversary. The MJOLNIR Mark VI HUD. A Sangheili combat harness HUD. John-117's Mark VI HUD in Halo 2: Anniversary. Thel 'Vadam's HUD in Halo 2: Anniversary. The Mark VI HUD in Halo 2: Anniversary multiplayer. A Sangheili combat harness' HUD in Halo 2: Anniversary multiplayer. The Mark VI HUD in the Halo 3 Beta. The Mark VI HUD magnification system. The Sangheili combat harness HUD. The Sangheili combat harness HUD magnification system. A Forerunner Monitor's HUD from the gameplay mode Forge. A Forerunner Monitor HUD Zoom. The HUD of the ODST armor system with VISR enabled. The HUD of the ODST armor system with the magnification system enabled. Jun's Mark V HUD in Deliver Hope. Kat's Mark V HUD in Deliver Hope. The pre-alpha build Mark V HUD. The pre-Beta build Mark V HUD. The Mark V HUD in the Halo: Reach Beta. The Sangheili combat harness HUD in the Halo: Reach Beta. The Mark V HUD in the final build. The Sangheili combat harness HUD in the final build. The HUD of a Forerunner Monitor's HUD from Forge. John-117's modified Mark VI HUD in Scanned. An early build of the GEN2 HUD. Early Spartan Ops look at RECRUIT-class Mjolnir's HUD. A variety of HUD designs from Halo 4, both concept art and final game. John-117's modified Mark VI HUD. Gabriel Thorne's GEN2 RECRUIT-class Mjolnir HUD. Carlo Hoya's GEN2 OPERATOR-class Mjolnir HUD. Jameson Locke's HUNTER-class Mjolnir HUD in All Hail. John-117's GEN2 Mark VI HUD in The Cost. Early concept exploration for Spartan HUD design language. Design exploration for Blue Team HUD designs. Design exploration for Fireteam Osiris HUD designs. Concept art of John-117's helmet interior. Concept art of Linda-058's helmet interior. Concept art of Frederic-104's helmet interior. Concept art of Kelly-087's helmet interior. Concept art of Jameson Locke's helmet interior. Concept art of Olympia Vale's helmet interior. Concept art of Holly Tanaka's helmet interior. Concept art of Edward Buck's helmet interior. The MJOLNIR GEN2 HUD in the Halo 5: Guardians Multiplayer Beta. Work in progress John-117's GEN2 Mark VI HUD, using the default MJOLNIR GEN2 HUD. Later work in progress John-117's GEN2 Mark VI HUD. Work in progress Jameson Locke's HUNTER-class Mjolnir HUD. A later work-in-progress version of the MJOLNIR GEN2 HUD. John-117's GEN2 Mark VI HUD. Jameson Locke's HUNTER-class Mjolnir HUD. Edward Buck's HELLJUMPER-class Mjolnir HUD. Olympia Vale's COPPERHEAD-class Mjolnir HUD. Holly Tanaka's TECHNICIAN-class Mjolnir HUD. ODST HUD in Halo: Helljumper. HUD from the Prototype Powered Exoskeleton as seen on the Halo Legends episode Prototype. Mark IV HUD as seen in the Halo Legends episode The Package. John-117's Mark IV HUD as seen in Halo Legends: The Package, with MA5C. The magnification function of the Mark IV HUD system in Halo Legends: The Package. Mark IV EVA variant HUD also seen in the Halo Legends episode The Package. Solomon-069's Mark IV HUD in Halo Legends: The Package. Kelly-087's Mark IV HUD in Halo Legends: The Package. Fred-104's Mark IV HUD in Halo Legends: The Package. Black Team's MJOLNIR: Black HUD in Halo: Blood Line. The SPI Armor's HUD from the Headhunters motion comic adaptation. VISR mode integrated into Jonah-B283's HUD. 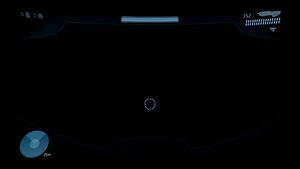 A CAMS cadet's HUD in Halo 4: Forward Unto Dawn. ONI operative Nightfall armor HUD in Halo: Nightfall. Gabriel Thorne's GEN2 RECRUIT-class HUD in Halo: Escalation.